Photograph signed "Vl. Horowitz, March 1939. London". 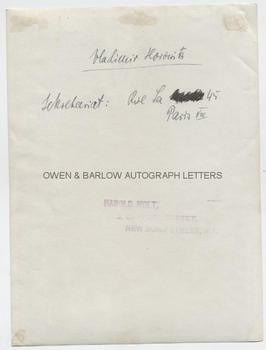 With his name and the address of his office (which also appears to be in the hand of Vladimir Horowitz) on verso, with stamp of the agent, Harold Holt. Approx 9.5 x 7 inches (24 x 18 cms). Slight mounting traces to edges of verso, else fine. 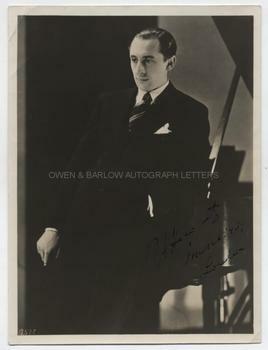 A nice portrait, showing Horowitz in relaxed pose, three-quarter length, leaning against a piano. Vladimir Horowitz is one of the most revered of 20th century pianists.